Debt crises are long running things. Reinhart and Rogoff have said so before and continue to remind us about it often enough to think that by now, everyone would be cognitively aware of this aspect of the modern day economy. But, given the hopping and stomping associated with Europe's latest bout of 'fakecovery', some of our media do still require a reminder: debt crisis are long running things. Taken 1 and 2 above, the entire narrative of 'credit-starved' companies in the European space is a bit questionable. 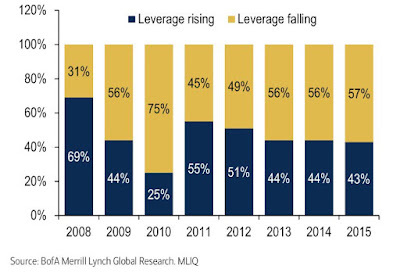 As far as demand goes, only 43% of European firms are interested in increasing debt levels today, the second lowest since the start of the Global Financial Crisis.